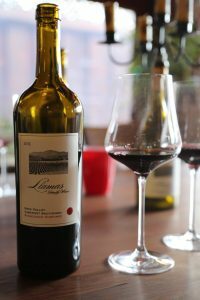 Llamas Family Wines is a partnership between Alejandro (Alex) Llamas and his Uncle, Oscar Llamas & his wife Lola. Their first vintage was from 2009. Both are passionate about wine and vineyards but it was not wine that we initially spoke about when we first met. Rather it was farming and family and the history of how their family came to the Napa Valley. The Llamas family is from a small town near Lake Chapala about a 3 hour drive from Guadalajara in the state of Jalisco, Mexico. Alex’s grandfather Jesus Llamas operated a family farm raising a variety of crops as well as animals. He first started coming to the United States in the early 1960’s following the agricultural seasons – starting work picking table grapes in the Coachella Valley and moving north until eventually reaching Oregon where he and his family would pick cherries. Then they would retrace their route slightly by finishing the season picking olives in Corning, California before returning to Mexico. The Llamas family would do this type of work every year driving up to California from Guadalajara (often taking 4 days to make this drive) – brothers, sisters, aunts, uncles and cousins. The family became known for their strong work ethic and finding jobs was never a problem. Part of their work took them to the Napa Valley for 6 weeks every year during harvest. The work was not easy but always involved the entire family. Usually their employer would provide their housing but sometimes they would end up sleeping and living out of their vehicles. Oscar, who was born in Guadalajara remembers long days working in the fields or orchards but always circles back to the strength of their family bonds. The men and women would share the cooking and cleaning duties – he nostalgically remembers preparing fresh tortillas nightly. And Alex’s memories of this work are from his childhood when older family members would call he and his brother, Los Barberos – translated into English as The Barbers. At their age they were too short to handle the heavy 14-21 foot ladders or climb higher in the trees, so they were always reaching for the low hanging fruit. The family even fashioned plastic milk jugs which they wore around their necks and were used for harvesting any reachable fruit from the ground. Looking for new opportunities Oscar settled in the Napa Valley in the early 1990’s and went to school to learn the art of collision repair. He opened Valley Auto Body in the city of Napa in 1992 and has built this into a successful business. Before becoming a winemaker, Alex worked at The French Laundry and Per Se restaurants and it was at these well-regarded culinary meccas where he he was exposed to fine wine and discovered a passion for wine. And he learned that his palate tended to gravitate towards more old world wines, especially those from parts of Italy. Alex also worked at Jarvis and Luna Vineyards in the Napa Valley. And in a story that can be fully appreciated by serious wine enthusiasts, Alex and his wife Michelle were engaged at Domaine de la Romanée-Conti in Burgundy, one of the world’s holy grail’s of wine making. The image of a scorpion is on the label of every wine. This was Alex’s father’s cattle brand at his ranch in Mexico. Interestingly enough, the Smithsonian reached out to Alex and Oscar wanting to interview them in regards to their family’s history and the Mexican-American contributions to agriculture and the wine industry. Alex and Oscar ultimately donated his original cattle brand to the Smithsonian so it could be a part of agricultural exhibits. And a photo of Stagecoach Vineyards is on their label – now one of Napa’s most prominent vineyard sites that their family helped developed and still oversee. Alex and Oscar went up to stagecoach one morning and took several hundred photos – ultimately choosing one image. While the Llamas family does not own vineyard land in the Napa valley their wines are made only from vineyards their family directly farms. Alex is the primary winemaker. 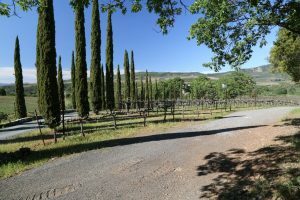 He compares a winemaker to a quarterback – someone who oversees the process but in reality has a lot of help ranging from those in the vineyards to those in the cellar. He considers one of his mentors, winemaker Matt Taylor (worked at Araujo now Eisele Vineyard for 5 years) and was involved in producing the early Llamas Family wines. Alex makes all the wine making decisions but Oscar is always involved during the blending sessions. All their wines go through primary fermentation using non innoculated yeasts (indigenous yeast). Alex compares wine to a time capsule – capturing a specific moment in time when one opens a bottle. To him, the most meaningful wines on the planet tell a unique story regardless of the price. From the vineyards to the vintner. One of the vineyard properties the Llamas help manage is Buhman Ranch, located about a mile north of Boon Fly Cafe on the Napa side of the Carneros District. The Buhman family has a 130+ year history of managing the site including ranching; John Jacob Buhman planted grapes here in the 1880s. Fruit goes to a number of producers including Artesa, Mumm, Joel Gott and for the Prisoner wine. As an interesting side note, the Buhman family initially sold land to the Truchard family (now prominent Carneros grape growers). And in addition to vineyards, part of the property is still used for ranching cattle. The 2014 Buhman Ranch Chardonnay is straw yellow in the glass – it shows very pretty aromatics with notes of orange blossom and stone fruits including nectarine and as it breathes more hints of lime. What is immediately captivating about this wine is the texture – creamy and supple across the palate, it simply feels good in the mouth. Shows bright fruit, mineralties, cut grass and flavors of peach. Clean finish. Has a mouth feel one would associate with a Chardonnay but a flavor profile that one perhaps might mistake for a Sauvigon Blanc if tasting this wine blind. The Llamas Family Cabernet Sauvignons, while stylistically similar are very different from each other due to their reflective vintages. The 2010 Stagecoach Cabernet Sauvignon is a throwback if you will, to the wines that were being produced from the Napa Valley 30+ years ago. Built with an old world perspective this wine is very food friendly. 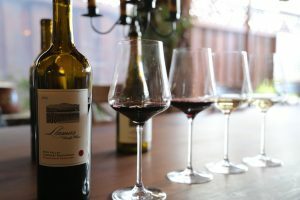 The 2010 Stagecoach Cabernet Sauvignon shows a smoky elegance on the bouquet – cigar smoke, jalapeno pepper with red cherry aromas and dusty nuances. Drinks younger then its vintage date, anchored by mouth watering acidity. Superbly balanced on the palate showing notes of red currant and cherry – with a tartness that lingers. Very polished smooth tannins anchor a clean finish. This is a wine that still has many years ahead of it. 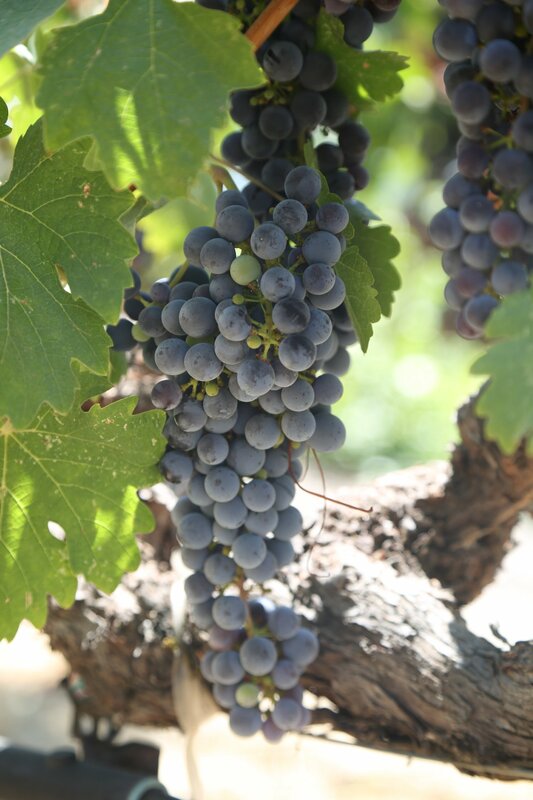 The 2013 Stagecoach Cabernet Sauvignon is a noticeably different wine then the 2010 vintage. A well-layered bouquet reveals darker fruit aromatics including blackberry and plum. As the wine breathes shows hints of dark chocolate, dust, along with various baking spices. Offers excellent balance. And for a big vintage from powerful hillside fruit – the wine is remarkably approachable in its youth. Red and darker fruit, hints of mocha and subtle notes of toasted oak and tobacco linger on the lengthy finish. The finish shows grainy but not gritty tannins. The 2014 Stagecoach Cabernet Sauvignon is somewhat savory on the bouquet – Alex compares the aromas to a grape pickers’ glove, sweaty, earthy, and dusty – the bouquet shows all this, but more including an appealing sweetness of fruit including blackberry. Very approachable on the palate – offers bright and lively fruit. Very good acidity. Earthy tannins are slightly grippy on the finish but not harsh. And for the first time in 2014 they produced a Reserve Cabernet Sauvignon – a tiny two barrel selection that Alex found when blended together produced a wine of superior character – a sublime wine as he calls it. They have no plans to produce this wine every year – it will only be created during special vintages. And in an exciting project for Alex and his wife Michelle, in 2018 they purchased 22 acres (Hollow Horn Farms) at about 5,700 feet in Colorado – with plans to grow wine grapes – eventually producing another label.